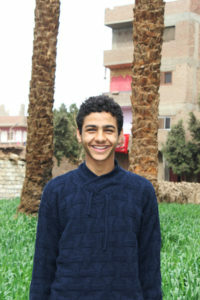 Ahmed, 15 years old, lives in the rural farming community of Assuit in Abnoub, Egypt. His family consists of his father, mother and two siblings, Mahmoud and Sara. As with most of the local families living in Ahmed’s low-income community, his father pressured him to drop out of school to help support their family’s basic needs. Without another resource to support their livelihood, their family wouldn’t be able to afford food or clothing. “My father asked me to quit school. Obeying his wish, I started working, as he does, as a local worker, leaving all of my dreams behind,” Ahmed remembered. His father made a small income by knocking down walls or parts of houses prior to construction projects. Many children in Assuit feel this threat to continuing their education, and suspend their ambitions. 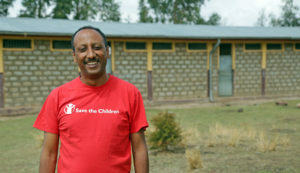 Through a Save the Children volunteer working in his community, I heard about Ahmed’s situation. I visited Ahmed’s house and urged his father to let his son continue his education. I explained that through our program, Ahmed could learn how to obtain a small loan and how to start his own business project. He could participate over the summer, learn how to earn money and still return to school at the start of the next academic year. Though he refused at the beginning, I was able to convince Ahmed’s father to enroll him in our adolescent development program. Ahmed with his brother Mohamed and cousin Mahmoud proudly sitting on their very own plot of land. Our work aims to build teens’ life skills, by providing career counseling and livelihood activities so they can explore labor and local market needs and be prepared to make informed career choices. They also learn how to develop projects using local resources. Through these activities, adolescents are given the chance to play an active role in their society. Without them, they would have had no career options except to follow in the footsteps of their parents, finding work in low-paying local labor. “I still remember how helpless I was before Mr. Helmy’s visit. All I knew was that I would end up with a chisel and a hammer just like my father,” said Ahmed. Ahmed started participating in our Tomohaty program, meaning “Ambitions” in Arabic, in May of 2017. He learned how to start, manage and finance his own start-up business. He even motivated his brother and cousin, Mahmoud, to join, who was also in a similar situation with his own hardworking father, hungry family and personal desire to finish his education. Together through the program they were able to receive a loan to rent a small plot of land. The boys started cultivating a farm with mulukhiyah, a vegetable plant common in Middle Eastern countries and a main component of traditional dishes in the area. The farming skills they already had learned from their grandfather, so now with the loan and the skills learned on how to manage their expenses and goals, they were ready to try something new. By the end of the summer, they were able to successfully grow three harvests of the crop to sell, covering all of their expenses and helping their families. 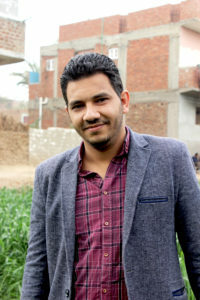 Ahmed learned how to manage a business project through sponsorship. “I am now self-confident. I feel like I’m able to reshape my future. I feel powerful.” said Ahmed proudly. With the extra money made over the summer, Ahmed was able to return to school. Today, his next big dream is to finish high school. Without sponsors, many children would remain as Ahmed was before sponsorship, deprived of any ambition, dreams, hopes or goals. 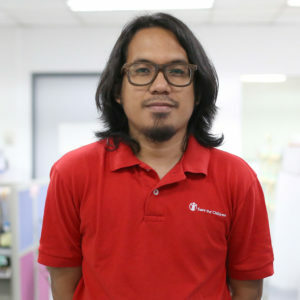 “One of the reasons I feel proud of being part of Save the Children is our ability to create new opportunities for children.” said Ahmed, with a worldly understanding beyond his years. 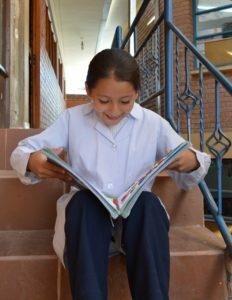 Meet Samantha Melody, a lively and happy third grader from Cochabamba, Bolivia. Who could imagine that just a few months ago, Samantha Melody was a very shy girl who didn’t have any friends in school, mainly a result of her difficulty pronouncing words and organizing her thoughts to be able to communicate her feelings to others. Most children like Samantha Melody need encouragement to start opening up and be confident in social situations at school or in the classroom. However, in the past teaching methods in Bolivia had always been based on repetition and rote memorization. As a result, lessons were not fun for students – leaving them feeling bored and unmotivated to participate during school. To help address this need, Save the Children trained teachers at Samantha Melody’s school on new teaching methodologies that not only make sure children learn in fun, interactive and innovative ways, but also take into consideration their emotions and feelings. 8-year-old Samantha Melody (center) with friends Yuliet and Gissel Jazmine. 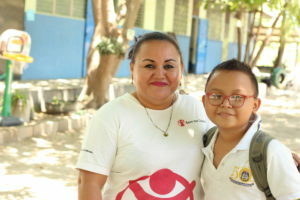 After participating in these trainings, Ana Maria worked hard to apply Save the Children’s literacy strategy in her classroom to motivate Samantha Melody and other struggling learners to enjoy reading. 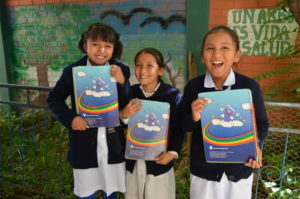 Through sponsorship, teachers learn to work with their students in participatory and game-like activities, like using reading aloud sessions and dramatizing the stories they read in class to make the books come to life, for example by using role play with the students or acting out characters’ voices in the story themselves. Reading cards are another tool provided by Save the Children, an exercise allowing children to pull important information from the story and write it on a card to deepen their understanding of the story and lesson. These new approaches to teaching help children develop a love for learning and the necessary cognitive skills required to interpret what they read or hear, and to discuss it with their peers. All of this helped Samantha Melody develop her communication skills to be able to express herself with confidence. Samantha Melody loves reading stories on her own and at school with her teacher and classmates. My name is Shanya. I’m 17 years old and live in rural Tennessee. There are many problems in my community – kids fall behind by the time they get into middle school. I live in a high poverty area where many parents hold down two jobs and have trouble being there for their kids as much as they would like, for example after school to help with homework. There are kids in our community who don’t have much, and you can tell that a lot of them are going through a lot just by the expressions on their face. I hate to see that. They deserve so much better. But, things are starting to change. 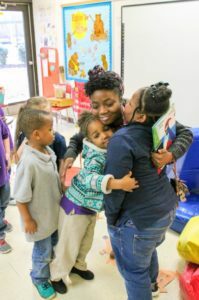 Shanya gets a bear hug from 5- and 6-year-olds Ja’Myra, Marterreon and Alissa. This year, Save the Children started a community collaborative in my county. The community collaborative gets together business people, people from community groups and churches, parents and others who want to help kids do well in school. After that I met Chase, who would be working with our community on behalf of Save the Children. Chase meets with the collaborative and organizes events to help get kids in our community reading. He asked me if I could be the student volunteer leader. The work was to start right away. I said yes! In rural communities like ours, the library is the only place for many children to have access to books. So, we wanted to do something that got books into the hands of children who had few or no books at home, as well as show parents and community members how they could get involved with the good work Save the Children was doing. We decided to organize a Christmas parade, where we could hand out books to kids and bring families together. I helped build the float with six other volunteers. We had so much fun doing that! I thought it was so sweet to see the kids smile when we gave them books. 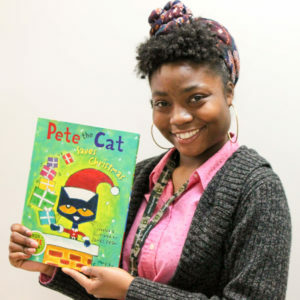 I thought kids would be like, “I don’t want that.” But, once you see the smiles on their faces and you ask them, “Do you like to read?” and they answer “Yes,” and Thank you,” – you feel so great seeing that. The kids were so happy and the parents were happy. And that made me happy too. 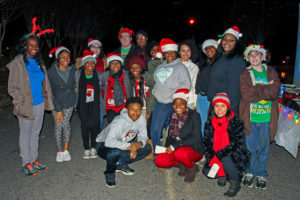 Shanya and other student volunteers at the Christmas parade. I used to be kind of a mean kid. I didn’t do stuff like this for my community. But now I feel like it’s our community, and I’m a part of it! With the support of Save the Children, people are starting to work together to help each other. After the parade, I started a volunteer program through our high school to go and read to the kids at the elementary school. I rounded up lots of students from the high school to help – cheerleaders, basketball players and church members. I told them “This would be a great way for y’all to step out into the community for people.” Our community isn’t used to seeing kids my age volunteering, stepping out of their comfort zones. My friends ended up having a great time volunteering to read with the kids, and now I see that big things are happening for our community. Now, I think maybe one day I could become a teacher. Those kids just brighten up your day. My name is Vanessa. I am the mother of two children, my son Abelardo who is 11 years old and my daughter Yanitzi who is 5. 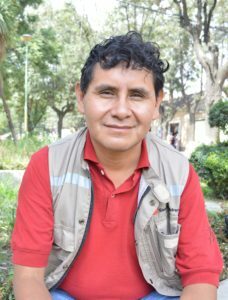 I have had many jobs to help support my family, such as work in agriculture, harvesting sugar cane, sweet plantains, beans and other crops, as a cashier and in a maquila factory, or a kind of industrial manufacturing factory, as a seamstress. While I was working in that factory, my mom used to take care of my kids because I left very early in the morning and returned home at night. 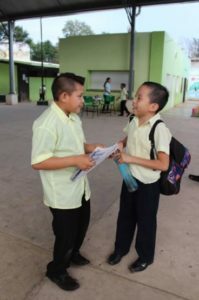 It is very common in this part of El Salvador for both parents to work outside of the community, spending long hours away from home and needing to leave children in the care of grandparents. Back in 2011, she is the one who told me we should enroll Abelardo with the people at Save the Children, after she had met with some members of our community who volunteered supporting sponsorship. I agreed just to please her. 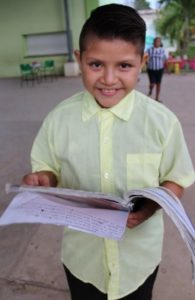 I remember I helped him to write a couple of letters to his sponsor, but other than that I wasn’t involved since I was always working. I knew my mom used to take him to the book circles hosted in our community, but I didn’t have time to know much more than that. Vanessa and her son Abelardo, age 11. Years later, when Abelardo was in third grade, I was not working in the factory anymore and had more time on my hands. I decided to look into volunteering with the organization I knew had been supporting the education of my son. Luckily, an opportunity to become the main point person for Save the Children on behalf of our community was available. I applied and thanks to the work experience I had and my high school diploma, I was selected by the community and by Save the Children. While volunteering, I received trainings on important skills and knowledge related to health, hygiene and nutrition. For example, how to make well-balanced meals for children at home or why handwashing helps prevent illness. I then cascade that knowledge through my community by meeting with school staff, who then in turn guide child groups through fun activities that teach them these important health skills. Now that I’m on the “other side”, I’m surprised with the many benefits our community receives thanks to Save the Children. My son has learned and changed a lot. 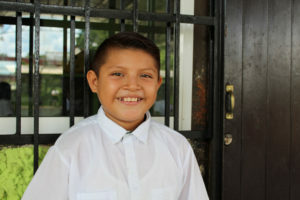 He is part of the health club at his school, another part of the sponsorship health and education programs, and his favorite thing is to practice and to teach the correct handwashing techniques. Abelardo teaching Yanitzi some of his health club lessons. I’m so proud that he knows I have this health knowledge too, and it’s been such a joy to be able to learn and experience this growth with him. In a small rural village in West Showa, Ethiopia, lives 10-year-old Kebene. Now in 3rd grade, she tells me her favorite subjects are Science and Oromiffa, the study of the local language. Most families work as subsistence farmers, although parents hope for better lives for their children. In this area, subjects like menstruation, reproductive health and family planning were traditionally not openly discussed by parents with their children, even considered taboo. Girls would be completely unprepared when getting their first period. They would run home from school, embarrassed and unsure of what to do. Luckily, teachers like Getaneh are working hard to prepare students like Kebene for the challenges of adolescence. “We help them to prepare for the changes they start to experience,” says Getaneh. Kebene (standing far right) leading an adolescent development lesson with her peers. He acts as point person for the community, working with Save the Children staff to ensure he and the other teachers learn how to discuss health matters with adolescents related to their reproductive and personal health skills, in particular issues that affect girls. In addition to training teachers, students are able to discuss harmful traditional practices, like early marriage or female genital mutilation, in a more comfortable and open setting – such as outdoors sitting in a group with peers and friends. Getaneh learned that even though she was still just 10, Kebene’s father already had plans to marry her off to someone she had never met. 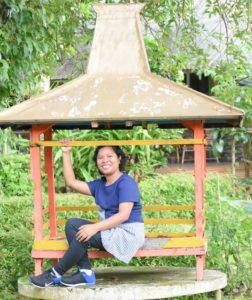 Luckily, thanks to the adolescent development programs now available at her school, she considered early marriage as something harmful, that restricted her from experiencing childhood and having choices in shaping her future as an adult. Zewge with some West Showa students in class. Kebene went to her school director for help, and now he and Getaneh are working to invite her father to discussions at the school, as well as meeting with community elders and local administration to help convince her father to change his mind. 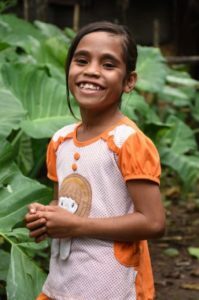 Though they are still meeting with him, they are confident they will soon receive the good news that she will be able to continue with her education. Kebene and her friends can now learn how to educate their families about why these traditions are detrimental to both their lives as children as well as the future of their village. By discussing these issues, they raise awareness on how they feel about their rights as children and as girls. In this way, knowledge is cascaded through the community. Thanks to sponsorship, now that these topics are taught at schools in child-friendly and relaxed settings, girls no longer feel too ashamed to go to class or fear speaking up about their hopes and goals. 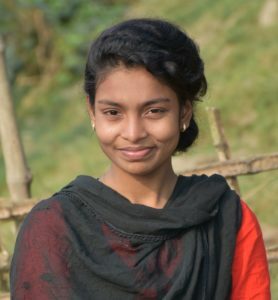 18-year-old Priyanka is in tenth grade in Meherpur, Bangladesh. She is confident after finishing her final exams next year, she will be the first member of her family to go to college. Her mother works maintaining their home for her and her two siblings, a brother and a sister, while her father resells wholesale fish for a small profit at their local market. Neither of her parents were able to finish their education or attend college, and like many families in this poverty-stricken area, they struggle to provide for their children’s basic needs, like food and clothing, on a daily basis. 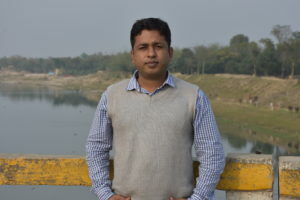 In this part of Bangladesh, usually only about half of students complete their primary education, and even those that did could not read fluently. Traditional practices like early marriage affected over 70% of girls between the ages of 12 to 15, further limiting the amount of children finishing their education. Schools were not friendly places for children to learn, with physical punishment still used in some classrooms and not enough learning materials for the students to get a good quality education. Mechanisms for reporting abuse like child labor or trafficking were insufficient or not utilized properly by parents, children and community members. Priyanka helping her mother with chores around the house. Priyanka first joined sponsorship 10 years ago, in 2008 when she was just 8 years old, and has steadily seen changes related to the attention given to children’s rights as she’s gotten older. Now as a young adult, Priyanka not only continues to benefit from sponsorship programs herself by participating in a group called the National Children’s Task Force, or NCTF, but also helps to spread those benefits to even more children in need. The NCTF was created by the government because of a national initiative to prevent the abuse of children, and to provide a forum for children themselves to communicate issues related to children’s rights to the government. Save the Children supports in providing NCTF child participants with trainings on how to communicate with the government through this forum, report abuse and lead discussions with their fellow students. Save the Children also helped children like Priyanka set up a website platform to share news related to children’s issues online. In this way, citizens are held accountable for reporting instances of abuse and the government is held accountable to take action after reports have been received. In this role, Priyanka acts as a leader amongst her peers, encouraging conversation related to the challenges or abuse children face in their communities and at school. For example, she works to increase awareness with her fellow students about how child marriage increases dropout rates for girls, and lowers their academic achievements. She hosts weekly discussions with the other kids and listens to their difficulties at school or at home, such as how they feel about the condition of their classroom, and shares her findings directly with government representatives every month. In this way, Priyanka not only helps report children’s rights issues to the government herself, but also spreads awareness on how to report child abuse amongst her peers. Priyanka participates in the National Children’s Task Force in her community. She even received a national scholarship award for her talent and leadership qualities. Mohan, Pranaka’s father, shared how inspired and impressed he was by the leadership skills seen blossoming in his daughter. “Becoming a teacher is no longer merely a job. It has become a calling!” Solvi, a third grade teacher at an elementary school in Sumba, Indonesia, said enthusiastically in an interview with me. Solvi is a passionate teacher who jumped right into her career after graduating with a teaching degree several years ago. The commitment to dedicate one’s life to teaching children is not a desire that suddenly pops up. It takes many long years of focus and growth. When she graduated, the world of teaching, particularly to younger students, had been so intriguing and challenging. Who could miss the opportunity to work and play with children or to help them pursue their dreams? What a contribution to the future of this country a teacher could provide through this role. It was a mix of idealism and adrenaline the young teacher possessed as she entered the classroom her very first day. Since then, she has learned that time can sap away your idealistic values and energy. Life may have not been as simple as expected. Solvi, a once passionate teacher felt she may have reached a breaking point, where she found herself reflecting on whether becoming a teacher was the right decision. She found that most of her early grade students were still unable to read fluently or construct words, and that generally literacy skills were lacking for whole communities all around their island. Teachers tended to be impatient when students struggled to read, meeting their challenges with the traditional teaching methods that did not allow for flexibility in lessons to teach children at different reading levels. Without child-centered or fun activities incorporated into the classroom, younger children were bored and frustrated in class, and not interested in learning. Parents, either due to their own illiteracy or due to time spent out of the home trying to earn a living, were unable to support their children’s education outside of school. 9-year-old Anastasia, one of Solvi’s students, saw the change in how her teacher treated her. After a few years dealing with these challenges, Solvi was close to giving up. She had changed from her formerly patient self, easily becoming angry with her students who were unable to understand the lessons. Likewise, her students felt awkward, uncomfortable and even scared in the classroom. Then came an invitation for a series of trainings conducted by Save the Children for teachers of early grades. Solvi jumped at the opportunity to participate. One specific training left a deep impression on her, on the topic of effective learning. She learned about how to realize and celebrate the different abilities of the children in her class. “We are taught that no child is stupid. They are all smart on their own. It depends on how we, as teachers, recognize their potentials and maximize [their abilities] for learning,” she said. Solvi and the other teachers learned different skills to use in the classroom setting, and how to deliver activities in fun and friendly ways for children. Solvi then came back to her school with a fresh perspective, determined to improve herself in her role as teacher. The first thing she did was to provide additional tutoring in her home for students who could not construct words and read fluently. “Starting something new needs strong commitment and I am ready for this challenge for the sake of my students.” she said. She had learned how to utilize the strategy of peer learning. Through this method, teachers pair students who are strong readers with those who are not. Using group or partner work in lessons not only helped make learning fun, but also benefited both struggling and strong readers with extra reading practice. Within months, after applying the knowledge she learned from the trainings, her students’ performance began to improve. Before trying her new teaching methods, only 6 of Solvi’s 27 students could read fluently. By the second semester of utilizing the new methods, almost all her students could. She had changed the way she approached her students. She learned how to understand and communicate with them based on their character. She set a good example with warm greetings and sweet words, to make her class somewhere all students felt welcome. She became much more patient and attentive to students with specific needs, building close relationships with each of them. Today, Solvi’s students look forward to seeing her every morning. Anastasia, one of her students, told me that she was surprised by her teacher’s transformation. While before she would be scolded for failure in class, now Solvi treats her more patiently. “I am sure my Ibu [honorable local term for female teacher] loves me.” Anastasia shared. “How we miss her terribly every time she is away from school. We cannot wait as the morning approaches to see her,” she smiled. Hello everyone! My name is Edwin Antonio and I am 9 years old. I live in a beautiful and colorful little town called Chemax in Yucatan, Mexico. I like it because we have nice green areas where I can play with my friends. In the mornings, I go to elementary school. I am studying in fourth grade, and I am very excited, as soon I will be in fifth grade – just like a big boy! At school, we learn how to read using fun games and songs. My school is also very pretty, green like my favorite color. I love it because we have a courtyard where my classmates and I play every day after class, and sometimes we ride our bikes there. As it is very sunny and hot over here, we drink lots of water from the filter we got thanks to our friends from Save the Children. Clean and fresh water that we can enjoy at any moment – this is something we did not have before. 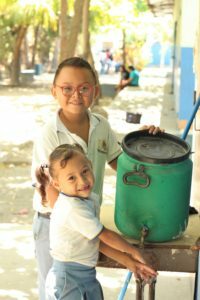 We had water at the school, but without the filter, we drank directly from the tap, which had unclean water and made us sick. There are lots of kids like me that have friends that send them letters. We love it! whole school’s love and appreciation. There are days when I feel even happier because I get letters from my friend from far away. My sponsor is a very good person. In her last letter, she told me that she is a lawyer and she has a kitten named Berry. I like her so much so I sent her a nice letter made all by myself with a lot of colors and a drawing, I’m sure she loves it. Having a friend like her is incredible because, even though I don’t know her in person, I know she thinks of me and always helps me in the ways she can. I am sure she is also happy to have me as her friend. Many kids like me have friends that send them letters at our school. We are very happy to know we can count on great and kind people like my sponsor and Save the Children. Did you know you could communicate with your sponsored child by email? This not only helps us save on postage and get even more money to our programs that benefit children, but also will help you get a faster reply from your sponsored child! Consider sending an email today by visiting your online account, at Sponsor.SavetheChildren.org/MyAccount. Every day throughout the world, girls and women face discrimination solely because of their gender. They are forced to leave school to work, exposing them to dangerous situations at a young age. Many parents believe that if girls become educated, they will no longer perform household chores and will inevitably delay marriage. Because of this, it is customary that girls leave school as early as 7th and 8th grade. With the right kind of help and guidance, girls can overcome gender discrimination and change the course of their lives. Adolescence is a time when children begin to shape their views and behaviors on the world around them. Thanks to our child sponsors, we implemented our groundbreaking Choices, Voices and Promises program in Nepal. This innovative program helps young girls and boys discover alternative, positive views of conventional gender roles and behaviors. Empowering youth is an approach to community development based on the belief that children can be actively involved in their communities, speak out about issues, communicate openly with one another and help solve community problems. We teach children advocacy skills and encourage leaders to mobilize resources to help create a more child-friendly environment. By giving children a voice, we are building the foundation for a future generation of thoughtful leaders. 16-year-old Sonu holds onto her school textbook inside of her home. Sonu first heard of Choices, Voices and Promises in 2015 while she was enrolled in the adolescent program at her school and quickly filled out an application to join. Initially, Sonu’s parents were hostile and questioned her choice about wanting to have involvement in the program. After some time observing Sonu within the program, they began to participate and were given videos to watch of parents with their children within their own community. The videos portrayed instances like a father helping his daughter with her chores so she has more time to study. It was after this that their mindset began to change. Twelve-year-old Beauven lives with her parents and older sister in a small house in the city of Caloocan in the Philippines. She enrolled in sponsorship in 2013 and has benefited from Save the Children programs ever since. Her father runs a small business selling meat and other food items, while her mother cares for her, her sister and their home. While they don’t have much, this doesn’t prevent Beauven from sharing what she has with those less fortunate than her. She is a shining example of helpfulness and generosity to other children. Beauven is a consistent honor student, and a regular in school competitions. She has already won several of these, from spelling bees to science quizzes to newswriting contests. But, Beauven is not one to brag about her achievements. “When you help [others], you get more blessings in return,” she said. In urban communities like Beauven’s, improving health and hygiene are big concerns for children. “When I see street children begging, I usually spare some change for them,” she said. Caloocan is one of the largest and most urbanized cities in the area, home to 1.4 million Filipinos sharing a packed 20 or so square miles of land. It has been labeled as one of the most crowded cities in the Philippines, and even the world. Because of the dense population, classrooms can reach up to 70 or even 80 students. Likewise, slum-like conditions in some neighbors make the spread of disease harder to control. Today, Beauven serves as the president of her school’s student government. 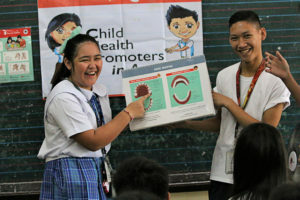 In order to help combat these issues, sponsorship started the Child Health Promoters program in Caloocan schools to spread health and hygiene knowledge. Through the Child Health Promoters, Beauven found another outlet for her generosity and desire to help others. 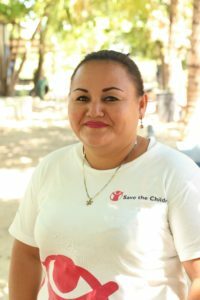 In her role as Child Health Promoter, Save the Children trained Beauven on how to mentor and coach the younger kids in her school, and how specifically how to pass on important health information and skills to the first and second grade age group. In addition to the trainings, Save the Children also provides these student health leaders with teaching materials, such as colorful images that show the parts of the mouth and how to clean them. “We teach proper handwashing, tooth brushing and nutrition,” she said. By teaching children about personal hygiene and nutrition, she is not only improving their health but also helping the young students’ pursue their education, since healthy children are able to attend class and engage more with their learning than sick ones. Being a sponsored child of Save the Children gave Beauven even more drive to share her knowledge and skills. She said she learned a lot ever since she became a part of sponsorship. “I learned how to communicate well with other people, and how to take care of children who are younger than me,” she said, adding that she also made many friends in the process. Her confidence in herself also changed. While she has always been bright, before her work as a Child Health Promoter Beauven was shy and didn’t know how to express herself very well. As she became more active in school activities, her confidence and public speaking skills skyrocketed. 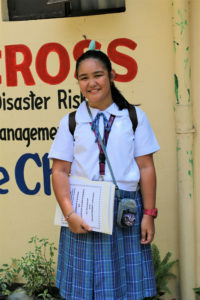 Today, she serves as the president of her student government at school, and attributes her trainings from sponsorship as a big factor in shaping who she has become as an adolescent. While she is not completely decided on what she wants to be when she grows up, one thing that Beauven is sure of is she wants to be successful in order to help other people. She is very thankful for all the support she receives, and this is what inspires her to do her best in life. She sees her new knowledge as blessings that should be shared with even more children. “The help I receive, I want to share with others,” she said.